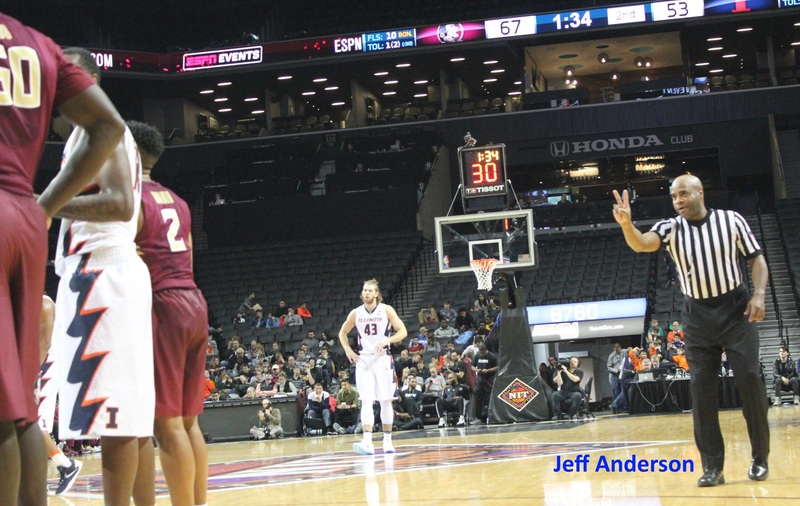 “Is it common knowledge that Barclays Center has a grass roof?” I asked Jason Marry, as I sat down on the baseline of the Brooklyn Nets’ home court. Jason, who pays attention to sports, assurred me that I was not alone in my ignorance. For some reason, sports fanatics tend to focus on the sports-oriented aspects of sports. They don’t talk about the architecture. Tomorrow, I’ll be in Miami. I hope I won’t write about their architecture. I like their architecture, but I’m hoping I’ll have something interesting to communicate about the development of a basketball team. In this column, I’ll write about the architecture. i.e. the non-sports stuff I delight in observing while following Illini basketball around the country. But I’ll also write about the basketball. There’s an evolutionary arc I’ve been watching. I don’t know when or where it might complete, or manifest itself. Some unanswered questions will determine whether this team will make the tournament, or require Josh Whitman to Make A Change. The themes of this column aren’t new. 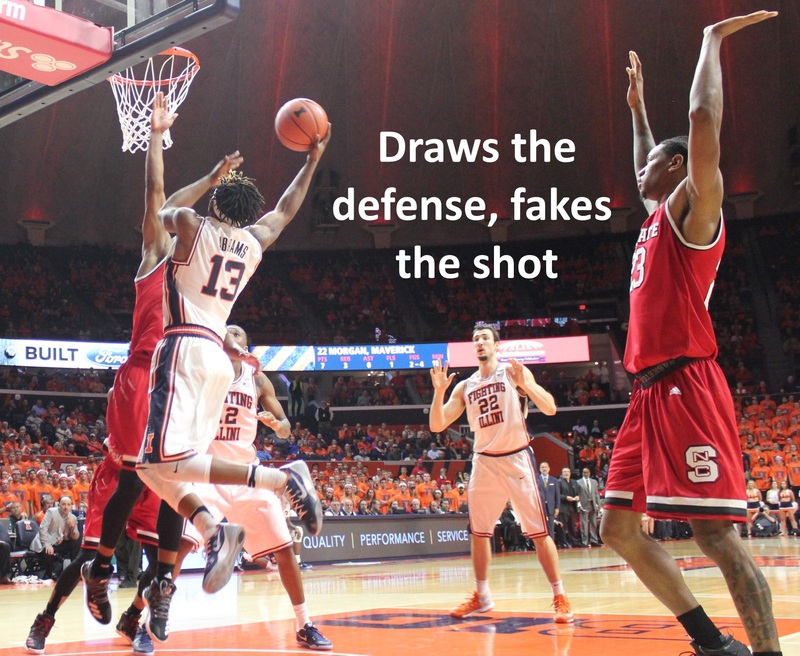 It’s about Tracy Abrams’s composure, his shot selection. He’s always been great at controlling teammates. It’s his ability to control Tracy Abrams that’s always been the question. 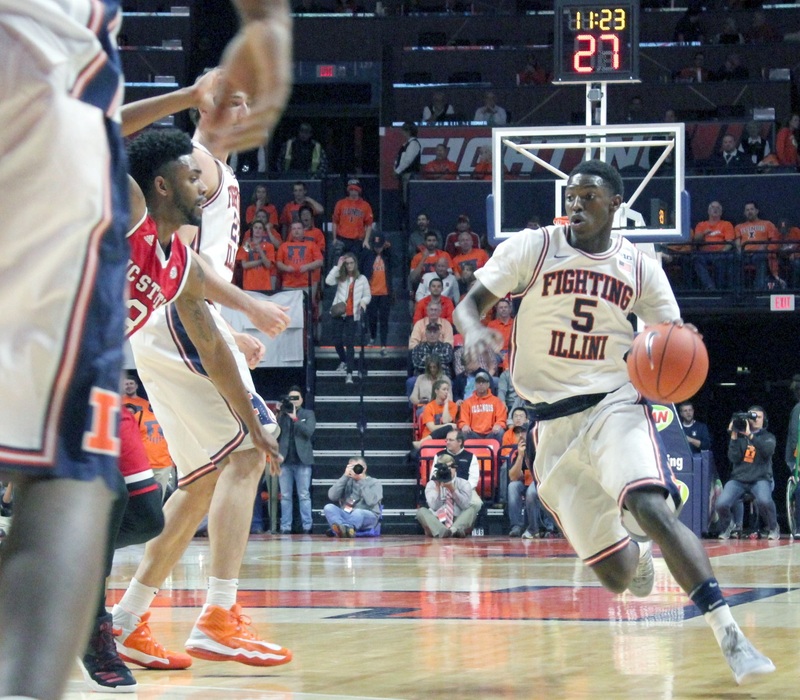 He’s like Chester Frazier: Among the most self-disciplined Illini when it comes to work ethic, off-the-court deportment, navigating the potential pitfalls of being a student-athlete. He’s so good, so strong, so determined in those areas; that it’s hard to comprehend his moments of folly on the court. That he played with Rayvonte Rice offers a great comparison. Rice frequently attempted the spectacular, and succeeded. But his team lost. Abrams must resist attempting the spectacular for his team to succeed. Will he also be like Chester Frazier in providing a senior year where his shooting drastically improves, and his decisions don’t cost games? Subject #2 of the evolutionary arc is Jalen Coleman-Lands’s second dimension, and his third dimension. 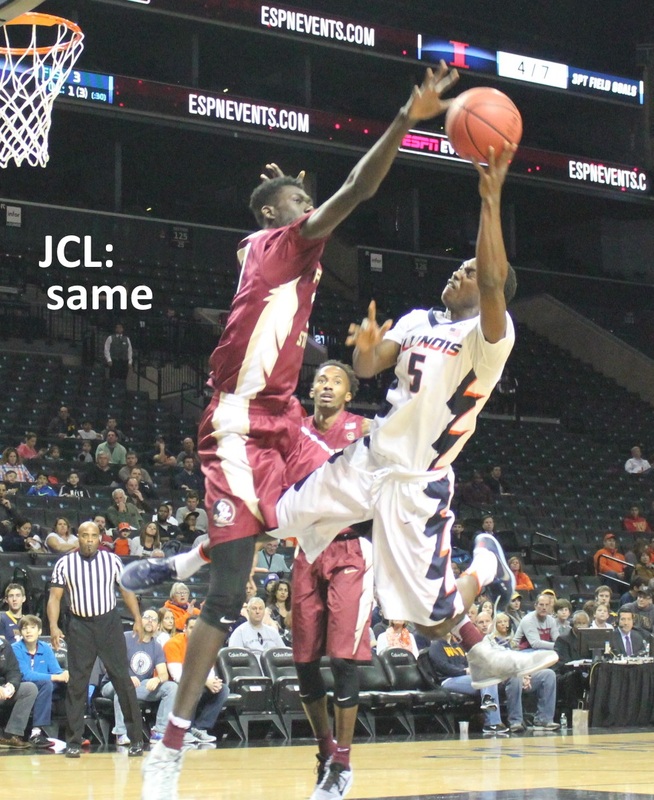 Considered by some to be a “three-point specialist,” JCL is most exciting to watch because of his behind-the-back passes, and drives to the hoop. He drove the lane at the Barclays Center, and got stuffed. Undeterred, he continued to drive against NC State, and he was successful. He also made a behind the back pass, and another quick pass in the lane. JCL and Abrams share a common gift/fault. They like to push the limits of basketball geometry. Sometimes, their angles are too acute. Abrams’s self-control and JCL’s dynamism are key ingredients to a successful season. 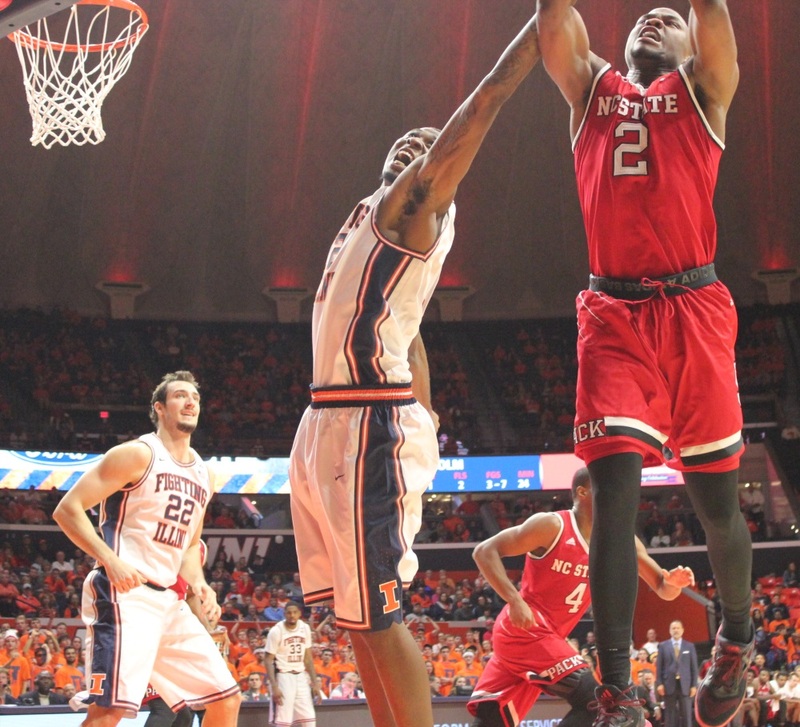 So are Leron Black’s 15-foot jumper, and his failure to foul out of the last two contests. Inevitably, it seems, this team will rely on its highest-rated recruits. On the other hand, no recruiting service wasted much ink on Te’Jon Lucas. And yet he’s emerged as this team’s fun guy to watch. 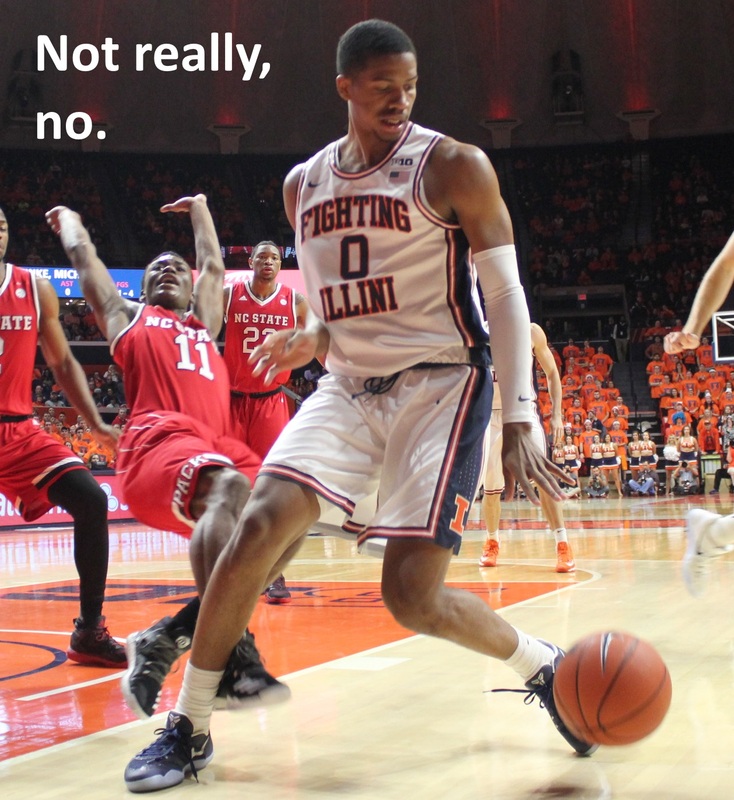 Over the last two weeks, Illini fans have demanded that Lucas get more tick. John Groce heard them. 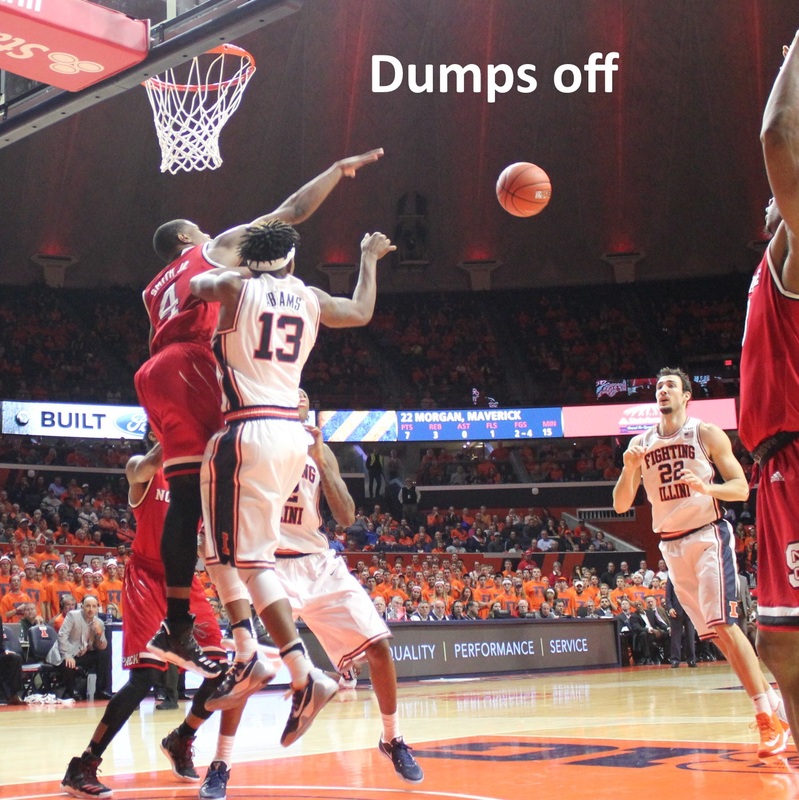 In particular, Groce heard Juan David Hoffman, literally. 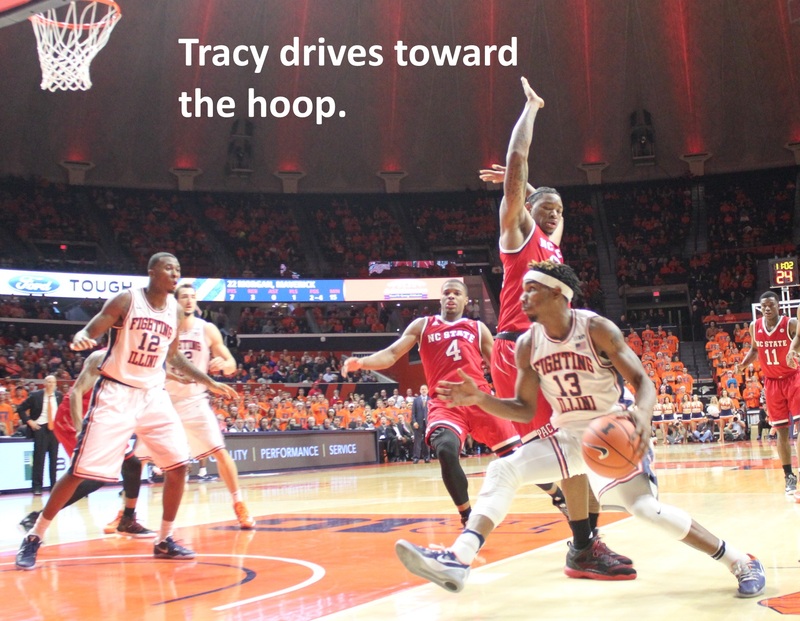 “Pass the ball!” Hoffman yelled to Abrams, as Tracy dribbled on the wing, no more than five feet from Hoffman. It’s not unusual for fans to scream at games. What’s unusual is for any particular sentiment to be audible for everyone, including the head coach. Dozens of people attended the Brooklyn games. No, really. Dozens. And because Hoffman was directly across the court from Groce, in an otherwise empty/silent mausoleum, Groce could hear everything Hoffman said. Intriguingly, Hoffman’s favorite topics reflect the general consensus. 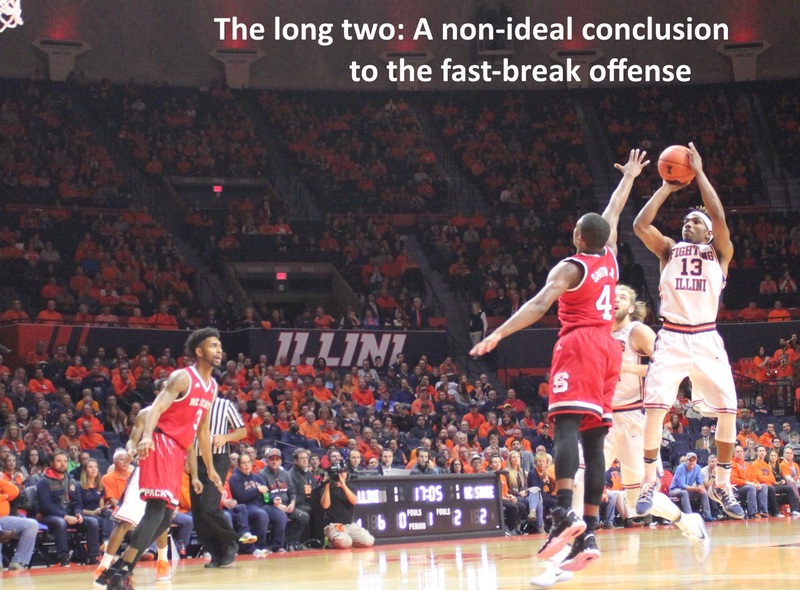 That’s not true of most courtside-sitters, who tend to be polite (and at least among the Illini fandom) unabashed homers. The type who never criticize the coach but do criticize the people who criticize the coach. 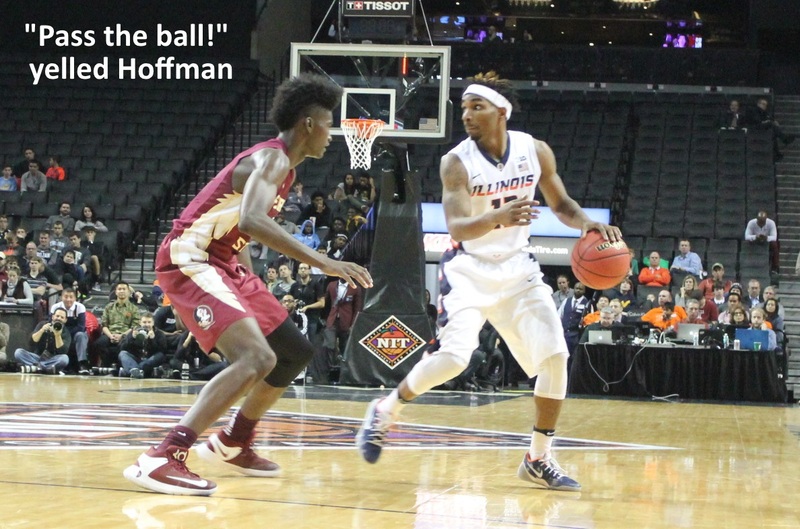 Hoffman, by contrast, vocalized everything you’ve been reading online about John Groce and the 2016-17 Illini. And Groce heard it. 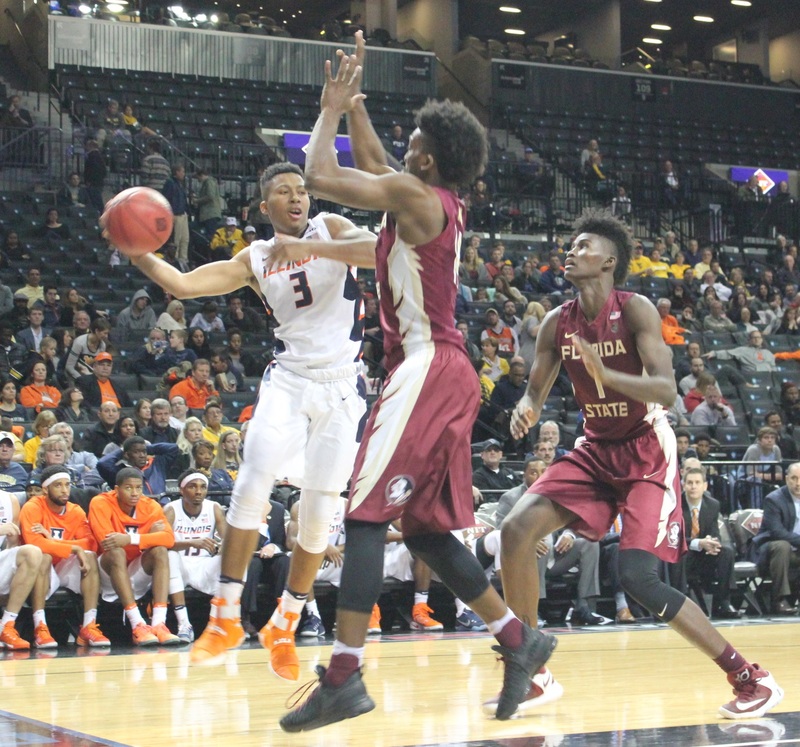 Groce’s demeanor is different this year, which suggests that he’s heard a lot of Hoffmans, or at least has begun to acknowledge agitation among the fanbase. Maybe it began when Groce was forced to hold a joint press conference with Josh Whitman. The most obvious change is the post-home-game press conferences. The players now show up independent of Groce, which means the media get started on their copy about 20 minutes sooner. That media was allowed to attend a pair of pre-season practices is also a novation. It’s pretty clear that Groce feels the heat. Some fans have declared that Groce’s tenure demonstrates a misjudgment about Bruce Weber. That’s insane. 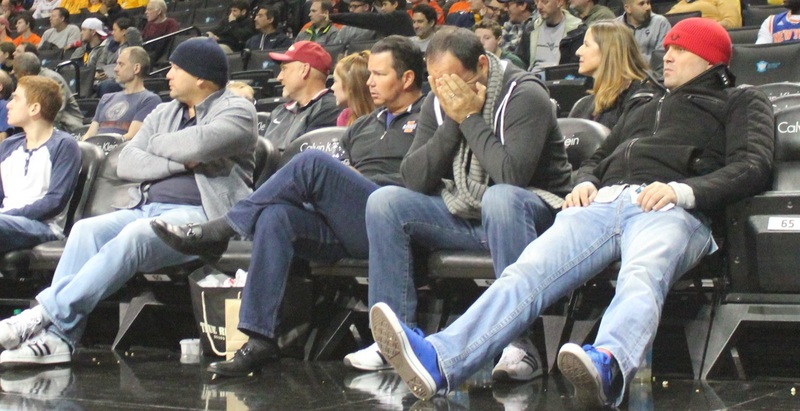 Whether or not John Groce is your guy, Bruceketball was torture to watch in 2012. So don’t even think that you’re worse off now. 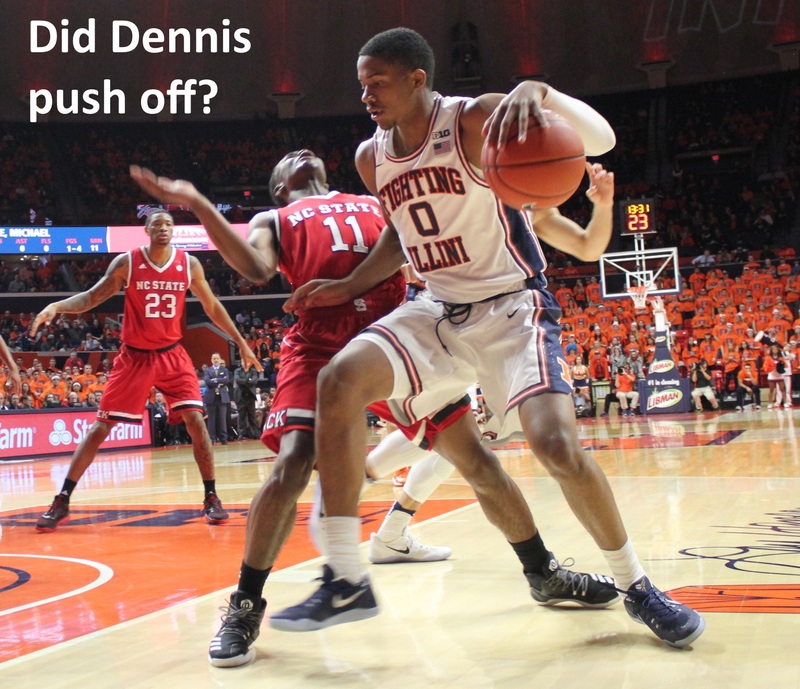 And these changes in Groce’s personal style, and the product on the court, are the best proof. Weber wouldn’t change. Conceivably, Weber couldn’t change. If you forgot what Bruce Weber looks like, look up “hidebound” in your dictionary. His picture appears next to that word. That game is now more than a week behind us. It’s pretty much forgotten, thanks to NC State. Thanksgiving’s West Virginia fiasco won’t be so easily forgotten. But unlike actual trauma, it will find retention in memory a tricky row to hoe. 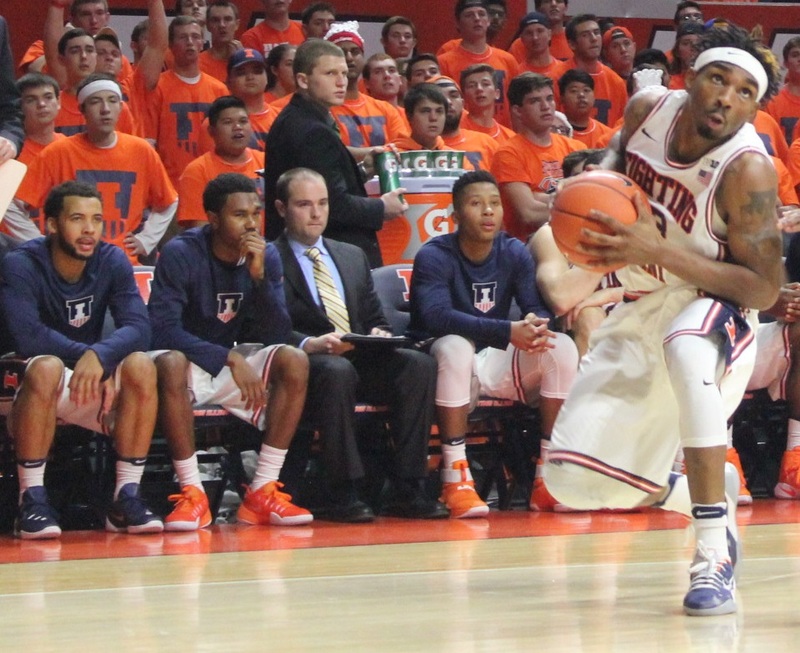 Illini fans, even those zealous to depose John Groce, can’t escape human neuroscience. We like to remember the good times. We remember things that nearly kill us (and, in theory, make us stronger). 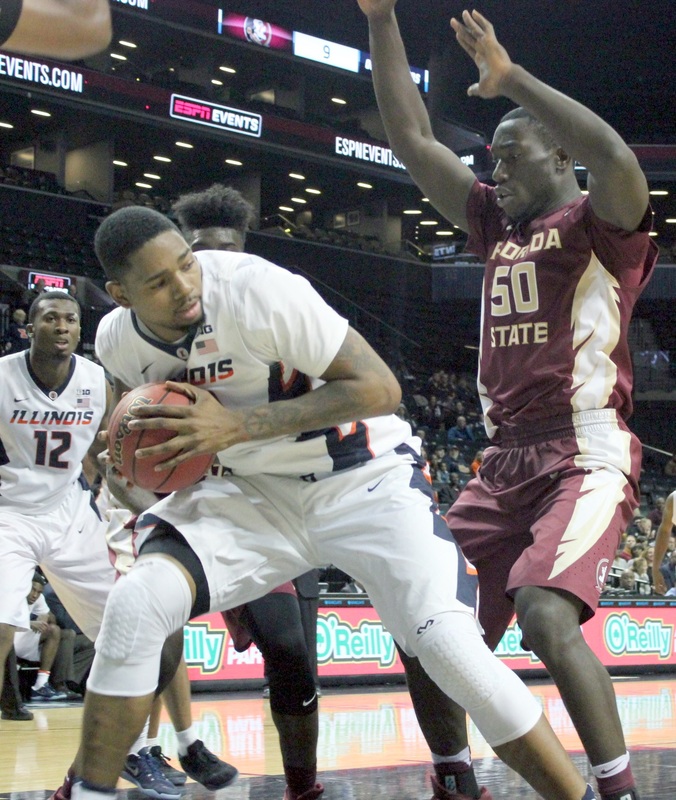 Illinois basketball’s decade-long slide into total irrelevance doesn’t threaten you physically. It won’t activate warning mechanisms in your brain cells. Lots of people showed up for the (final?) 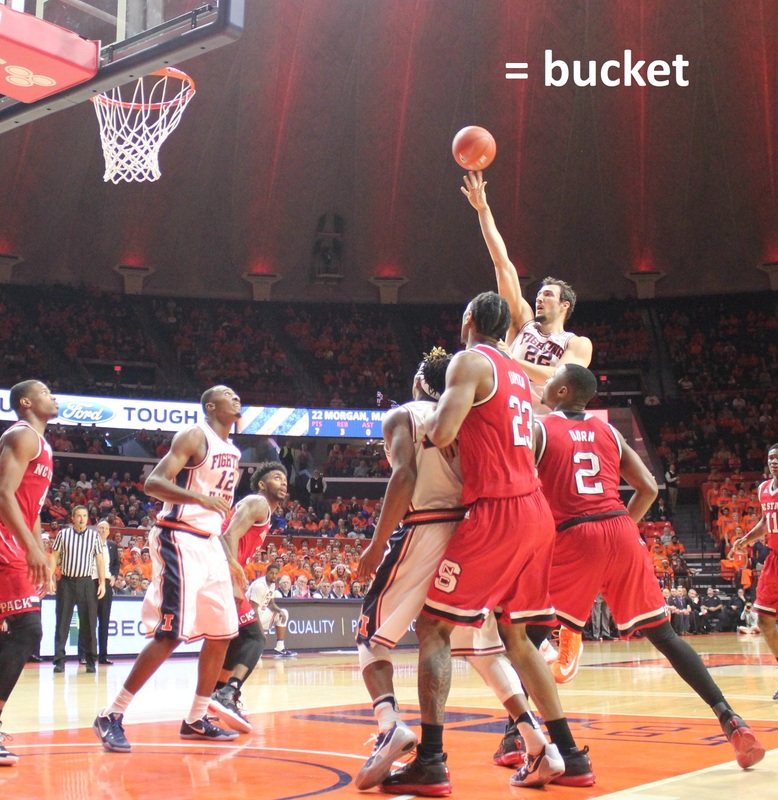 dedication of the State Farm Center, and they saw an entertaining win which temporarily quietened the pitchfork mob. If Illinois loses to VCU tomorrow, the pitchforks will return before sunset. If Illinois wins, they might not show up ’til 2017. 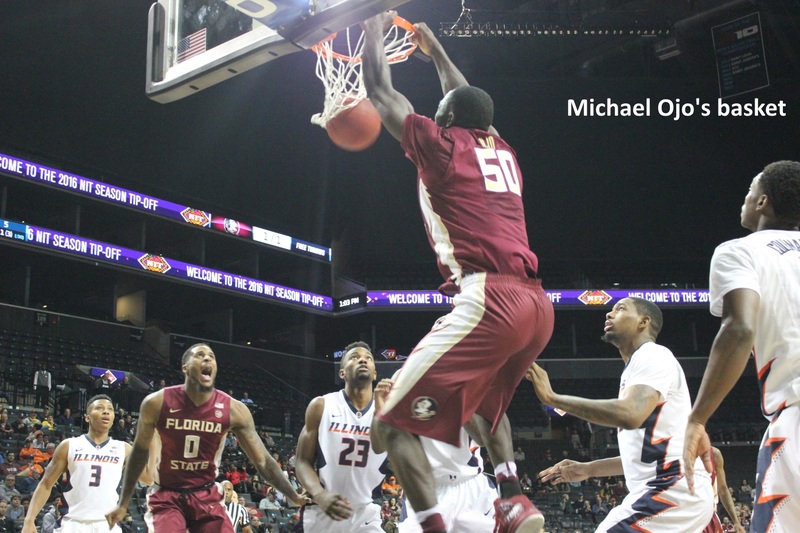 FSU’s Michael Ojo is one of those unfortunate persons who came to basketball as the result of a pituitary disorder. Isaac Haas is another. Some people are just unusually tall. Some people have acromegaly. 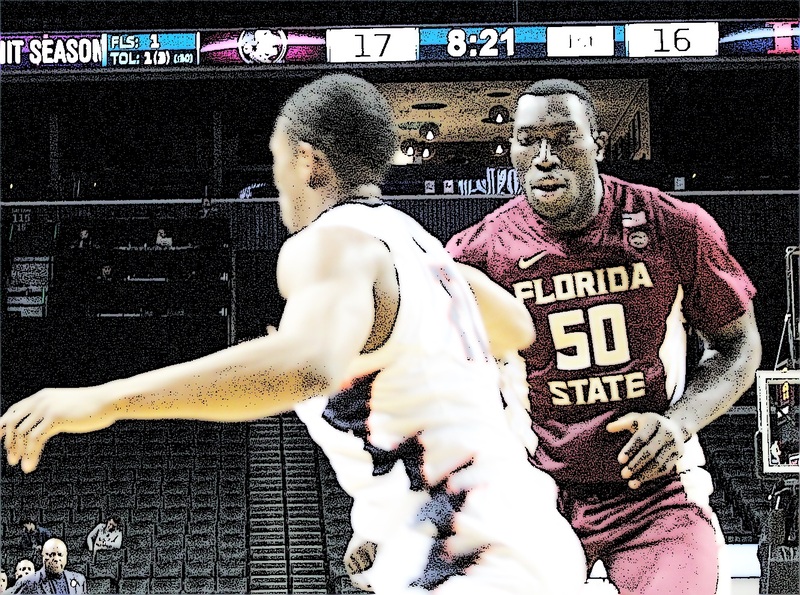 Perhaps it’s a poorly kept secret, but a lot of college basketball players aren’t all that great at basketball. They’re just really tall. 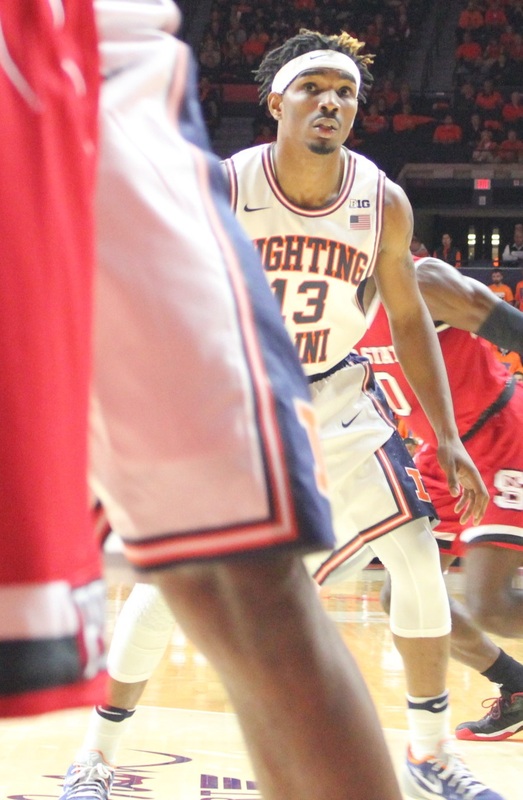 Keon Johnson reminded Illini fans that the most gifted basketball players aren’t always the most-sought recruits. 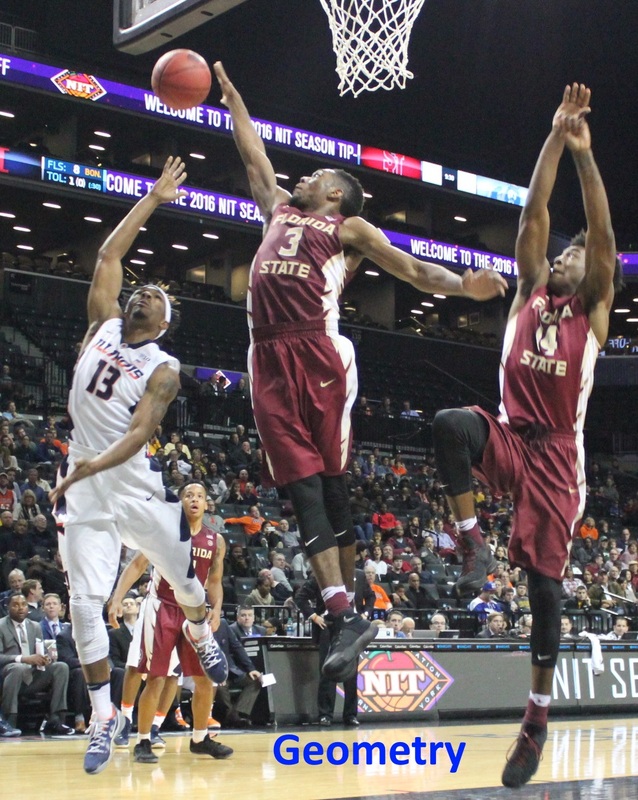 Rayvonte Rice should be playing in the NBA, but pro scouts continue to perseverate about his height, despite Rice’s eight year campaign of proving doubters wrong. 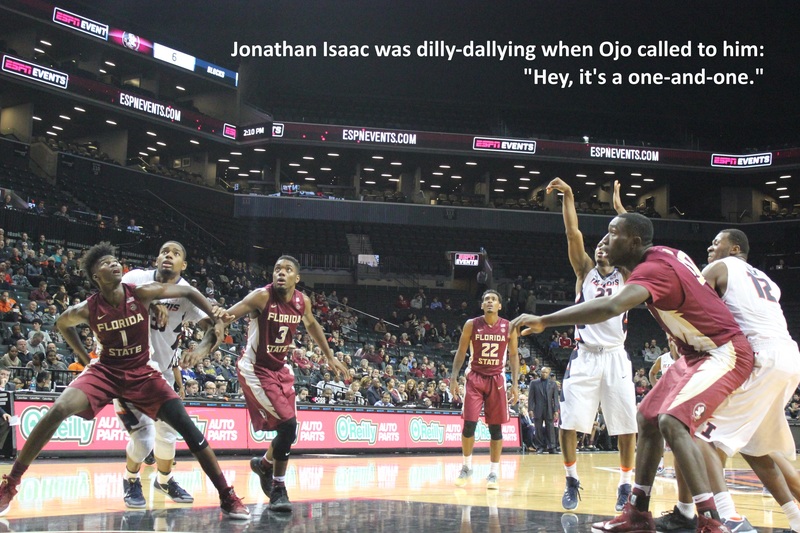 Ojo is 7’1″ and enormous all over. He’s African, and like a lot of African basketball players, he’s mostly a defender. He sees the game for what it’s become: soccer. It’s possible that he’s really funny. Lucas’s shots were also one-and-one. 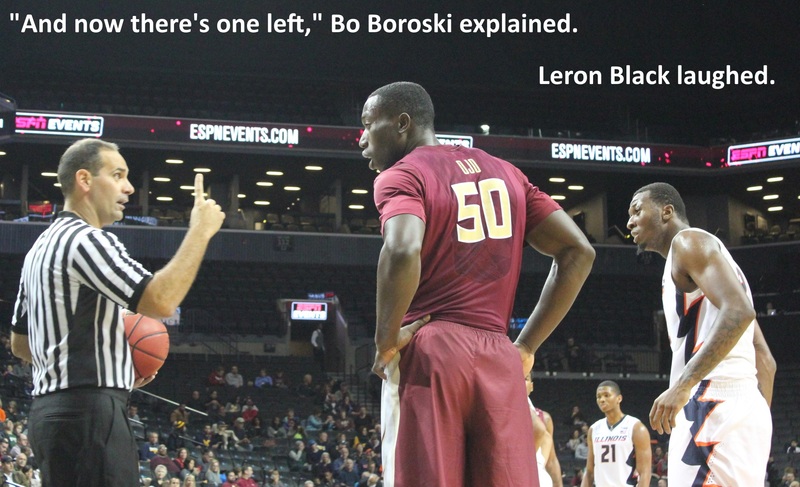 After Lucas drained the first attempt, referee Bo Boroski followed up. 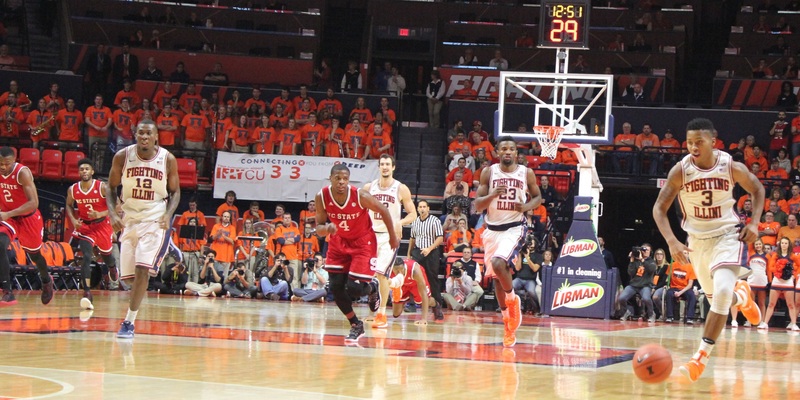 You surely get better coverage of Illini sports from other media outlets. I exist only to tell these funny little stories. Now I’ll have to decide if I really want to get on that 7 a.m. flight for Miami. After a week of looking after an elderly relative in Queens, I could easily be talked into staying home.